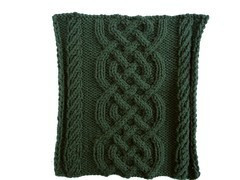 For this pattern I worked the "guts" of the "Wide Mock Rib" on each side of the celtic pattern. Work the Celtic Pattern (Celtic) a total of 3 times and Wide Mock Rib (Rib) a total of 12 times then just rows 1 - 12; a new repeat of the Rib begins after each 4th row of the Celtic pattern is completed. In otherwords there are 4 Rib pattern repeats worked for every 1 Celtic pattern repeat. The Celtic pattern is 16 rows, the Rib is 4 rows. (Border) row of 6 sts on each side of the Rib. On the RS it is begins SL1, K3, P2 and ends with P2, K3, P1. On the WS it is SL1, K5 at the beginning of the row and ends with K5, P1.